“Real” Match Racing in Monos? So familiar, and passing into history . . . the next contribution to the “take a ride on an America’s Cup boat” fleet? 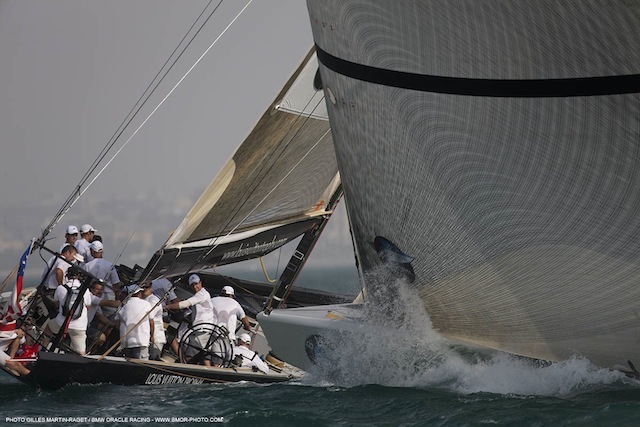 From the Louis Vuitton Trophy racing in Dubai, as I’m sure you know, where Jimmy Spithill and the BMW Oracle Racing team are showing they still know how to sail a monohull. In some people’s minds, this should be closer to the look of the future than the future. Moving on . . . I need to correct an item from my previous post in which I wrote that the Host City Agreement has been “signed” between the City, the America’s Cup Organizing Committee, and the Event Authority. Agreeably agreed, but not signed, would be more like it. Sigh. I can’t take me anywhere. But if you’re feeling ambitious, you can read the “HCA” right HERE.